Detailed Lord of the Rings prop replica. The Anduril Sword measures 52 7/8-inches long! Features a silver plated finish, 24kt gold plated fitting, leather wrapped grip, and more. 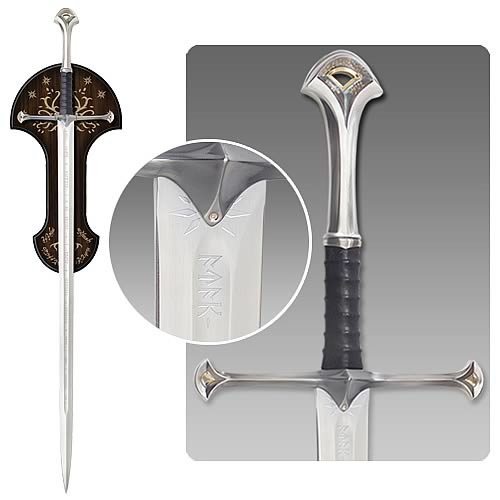 As seen in the Lord of the Rings trilogy, the Sword of King Elessar features a solid metal crossguard and pommel, antique silver plated finish, 24kt gold plated fitting, and genuine leather wrapped grip. The finely crafted sword measures 52 7/8-inches long, with a 40 5/8-inch long blade, which is made of a 420-grade, false edged stainless steel. Authentic runes are deep-etched on both sides of the blade, and the sword comes with a wooden display plaque and certificate of authenticity. Take home this finely crafted Lord of the Rings Anduril Sword of King Elessar today! Sword has dull edge; for display purposes only. Ages 18 and up.